Comfortable. Easy To Use. Easy To Adjust. Smooth Operation. Quiet Operation. Easy To Setup. Physical Therapy. General Fitness. Heart Rate Training. Comfortable. Stable. Easy To Use. Smooth Operation. Easy To Adjust. It is best used on carpet. Quiet Operation. It stays put best when use on the carpet and when you are properly aligned over top and not coming from behind the machine, causing it to travel. Great fitness prep for outside activities, ie; bike riding, hiking, etc. It's great while watching a show or listening to music. Unstable. Difficult To Setup. Rough Operation. Difficult To Adjust. Uncomfortable. Unattractive Design. This was one of the worst products I have EVER bought. The exerciser worked only in one way and my program required use of it in the opposite direction. I could not even get it started to move without having 20 lbs of weight on either side of the machine so that it would not move and even then it was nearly impossible to get started and extremely difficult to maintain momentum once started. The tension control was a complete joke. There was absolutely NO difference between minimum and maximum tension. The construction of the unit was incredibly cheap and shoddy, with the cover being loose and flimsy. As I said, the worst product I have ever bought. My PT was extremely disappointed as well, as she could barely get the thing to move in either direction. 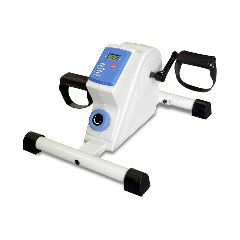 What kind of resistance control does the Cando Deluxe Exerciser have?